Starchitect Rafael Viñoly has designed a production of Monteverdi’s The Return of Ulysses. It will open March 28th at Chicago Opera Theater. Graduate School of Business at the University of Chicago (across the street from Frank Lloyd Wright’s Robie House.) Vinoly is also working on a hospital building for the University of Chicago, scheduled to open in 2011. It’ll feature a “Sky Garden” with broad views of Washington Park and the University of Chicago campus. I’m always interested in the confluence of Architecture and Music. In fact, I’ll be talking about it at Frank Lloyd Wright’s Unity Temple on March 31, in a benefit for the Unity Temple Restoration Foundation. I’m looking forward to seeing Vinoly’s Ulysses three days earlier. A happy coincidence . Daniel Libeskind’s Saint Francis of Assisi (Messian) at the Deutsche Oper Berlin. I found that a little too mechanistic in design and movement, and less revealing or supportive of the music. 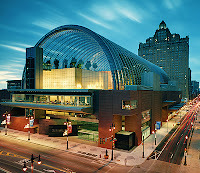 Kimmel Center for the Performing Arts in Philadelphia is musical architecture. Chicago Opera Theater run by Brian (“[I managed to catch Vinoly] for a moment during his crazy schedule of zooming around the world as architects do these days,”) Dickie, with Jane Glover conducting, is one of the top cultural organizations here. Their Nixon in China last year was unforgettably, mind-blowingly searingly good culture. They brought out the drama in that repetitive work by John Adams with superb singing, staging and many tv sets in a line across the stage. They made the normally pallid Harris Theater stage sing. Their contemporary staging worked well in that simple straightforward space. Try walking into there and not hearing music! You are currently browsing the archives for the Harris Theater category.